Tell us about Scanifly and the origin of your company. The solar industry has grown significantly over the last 10 years; however, it still suffers from some very manual, inefficient processes. Many solar installers rely on outdated satellite imagery, and sketch project mockups from scratch. They also perform site assessments with handheld tools, like a ladder, tape measure, SunEye, and pad and paper. These methods lead to wasted time, increased costs, and compromised project inaccuracy and worker liability. Scanifly has created a design software for solar installers that uses drones and 3D-mapping to automate the development process. Customers can upload drone imagery, design all in 3D, and export site specs, customer proposals, shading reports and CAD layouts. The software reduces surveying and design time by up to 90%, while enhancing system accuracy and worker safety. It will also increase sales volume by up to 10x. Lastly, solar developers will accelerate their sales conversions because customers can better visualize the project in a virtual replica of their properties. Prior to Scanifly, CEO John Novak experienced many of the aforementioned manual tasks firsthand while working as a design and monitoring specialist for two solar companies. After designing nearly 10 projects each day from scratch, guessing obstruction sizes, and estimating shading implications – typical industry practices – John knew that there must be a more efficient and accurate solution to creating solar arrays. That’s when he started Scanifly. Leveraging drone imagery for surveying sites saves a tremendous amount of time. For example, a commercial roof may take a day to tape measure, SunEye and analyze; with a drone it takes 20 minutes. Designers don’t have to guess tree or obstruction sizes, or any of the dimensions on the site. No more creating 3D models from scratch; solar installers can design in a virtual replica of the site. Visualize the solar project from any angle and perspective, which enhances the sales process significantly. Customers can therefore get a real world depiction of how their home or business will look with solar on it. Conduct real time shading analysis of the site without going on the roof. Dynamic shadow renderings that indicate the best and worst locations for solar modules throughout the year. Virtually add or remove trees to determine impact to shading. Developers can then analyze the impact of trees on projects before having to remove them. Survey and design projects immediately after rain or snow, regardless of roof conditions. 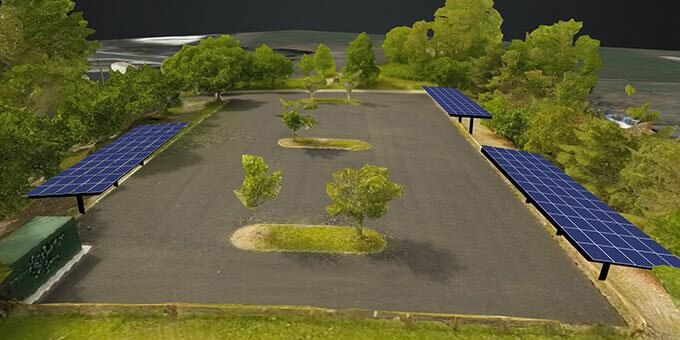 Customers can design for new construction by importing 3D renderings of homes, buildings and other structures, like EV charging units, carports or canopies. Give us an example of how drones can be used in the solar industry. Design - Site surveyors can fly a drone over a site, taking pictures of the site’s features. Then they upload those photos to the Scanifly cloud, whereby our software automatically processes them into a 3D model that is a to-scale, virtual replica of the property within inches of accuracy. The benefit here is that a solar installer doesn’t have to go on the roof or walk a large field. Time is cut down dramatically, and all features are automatically recorded in the drone imagery, which is geo-tagged and has longitude, latitude and altitude data points digitally stamped to the back of each image. Construction – Developers can fly the drone around a large scale project to assess the status of construction, and if any errors have been made. Commissioning – Drones are widely used today to generate marketing materials of projects from a birds-eye view. This is often conducted immediately after a project is placed into operations. 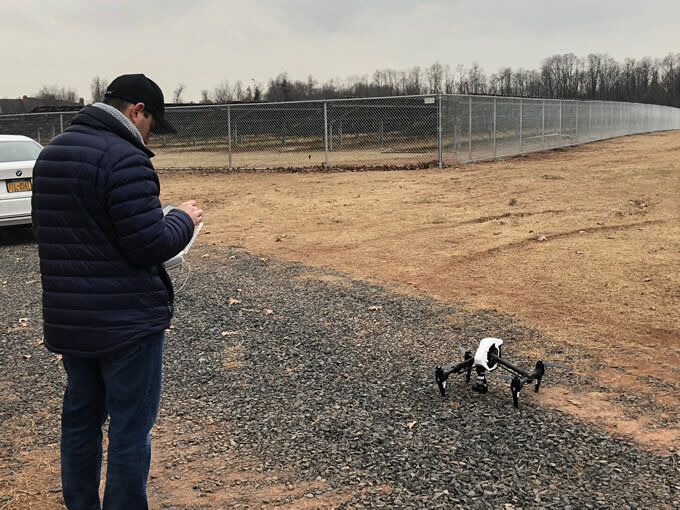 Maintenance – Drones with infrared cameras are frequently used to generate thermal imagery of large scale projects in order to detect hardware issues on the modules. Software is then used to search for hot spots on the equipment. This is one of the most common forms of predictive maintenance. How does LiDAR technology fit into this equation? There are two ways to 3D map a site: (1) Photogrammetry and (2) LiDAR. Photogrammetry is widely used now because it is low cost, easily accessible, and gets enough accuracy in most cases. It involves a small drone with a digital camera mounted to it. Photos of the site are taken using the drone, and those images are used to create a 3D model of the site. 3D models created with photogrammetry are within a few inches of accuracy, unless Real-Time Kinematic (RTK) corrections are used for centimeter-level accuracy. The downside of photogrammetry is that it will not capture finer details, such as trees without leaves, wire lines, tiny obstructions, or subtle changes in roof plane heights by a couple of degrees. LiDAR provides superior detail when compared to the photogrammetry method. A drone with a LiDAR sensor mounted to it can capture reality using an array of lasers to acquire coordinates which create a point cloud. The point cloud is then used to create a 3D model. Capturing reality using lasers rather than images (photogrammetry) allows for the creation of a higher resolution 3D model which shows the finer details such as trees without leaves, wire lines, etc. Most LiDAR-based 3D scanners today use Real-Time Kinematic (RTK) corrections to obtain centimeter-level accuracy. The downside with LiDAR is that it is significantly more expensive than photogrammetry. However we are seeing the cost of LiDAR sensors go down as the technology moves from mechanical to solid state. How does one learn how to fly drones to capture solar specific information? Is it difficult? It isn’t difficult, especially since drone technology is getting more intuitive and automated. We have built a turnkey program for introducing drones to solar companies. First, all commercial drone pilots need to have their FAA Part 107 certification. To assist in this, we’ve partnered with the Drone Pilot Ground School to help surveyors obtain their licensing. We have a discount for the curriculum pricing. Next, we advise prospective customers on what drones to buy and what drone flying apps to use. Often we suggest DJI Phantom 4’s and Mavics. Both are durable, portable and low cost. We find the DJI Go apps and DroneDeploy app most useful. Finally, we have webinars on best practices for flying drones. We also do webinars with prospective clients as they are going through their software trials. We recommend certain flight paths when flying in order to maximize 3D model quality. We will be going over all of these things in our NABCEP technical session. What's your view on drones and the future of solar? We’re very bullish on drones across all commercial applications, especially in solar. Solar companies that approach us often dislike going on the roof, documenting measurements by hand, or creating 3D models from scratch. Drones solve all of these problems in solar. Furthermore, solar hardware costs have declined significantly over the last decade, which isn’t a new story. Now we believe companies will look for ways to reduce soft costs, and create competitive advantages versus other solar companies. Drones are the technology many are considering.